We caught some of the Golden Globe Awards show earlier this month—we don’t watch to see who is wearing whom, but to see what the award recipients have to say in their short moments on stage. These can be important speeches—one year ago, Oprah delivered an acceptance speech so powerful that people began talking about her as a possible presidential candidate. henceforth known as the Carol Burnett Award. When Carol took the stage, the audience rose to greet her, treating her almost like royalty. 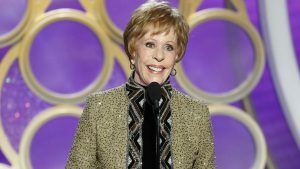 Carol, a comedy legend whose show we grew up watching, was gracious (“I’m really gobsmacked by this”), humble (“I realized how fortunate I was to be there at the right time”), and funny (“Does this mean I get the award every year?”). Ms. Burnett spoke in a very conversational tone, as if she was talking to a few friends, pausing often, making great eye contact with both the audience AND the TV camera. In less than four minutes, she reminded everyone why her years on TV were so memorable, and we appreciated seeing an old friend honored in this way. Then, she gave her signature line (“I’m so glad we had this time together”), tugged at her ear, and walked offstage to another burst of applause. Steve Carell introduced Carol —as well as a reel of highlights from her 60-year career in entertainment—in his own unique style. But he was more than funny—Carell called the moment “the greatest honor of my life.” That’s poignant! Glenn Close, clearly overwhelmed for a moment when learning she won the Best Actress award for the first time ever after many nominations, quickly regained her composure to honor her “category sisters” and then to encourage women to find personal fulfillment and follow their dreams. Standing ovation!